tl;dr — In the fall I’m moving to Atlanta and starting a math PhD program at Georgia Tech. I’m really excited! 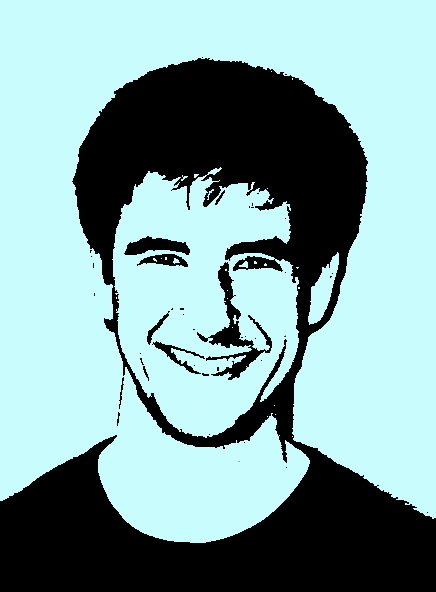 The long version: For the past two years, I’ve worked at Princeton Learning Cooperative. I’ve had the opportunity to help a diverse collection of teens to shape their lives and to pursue their interests and goals. In this time, I’ve had the chance to witness some incredible transformations. Kids who were pretty shut down when they came to us—avoidant, angry, listless, or painfully shy—have become happy, engaged, and funny young people who are excited about their futures. I’ve seen kids and families open up, unclench their fists, move past what their school experiences had led them to believe about themselves and the world, and start to build new and more joyful lives. More places like PLC need to exist, and more are popping up each year. If our mission and vision resonates with you, be in touch—with me or with Liberated Learners, our umbrella organization. I can speak from first-hand experience that operating an unschool can be a great life—immeasurably complex and immeasurably rewarding. I knew from the start that I would only be at PLC for the short-term. I was interested in encountering a certain kind of educational environment, but I knew that central New Jersey and PLC as an organization wouldn’t be long-term homes. One idea for my next step was to move somewhere and to start an unschool of my own, modeled on the thoughtful and well-executed systems that PLC has in place, and done up with all of my own little personal touches. But life is long, you know. Starting an unschool means putting down significant roots, and it’s just not where I’m at yet, both in personal and in life-arc terms. I won’t be surprised if starting an unschool is still in the cards for me, but I don’t think it’s a calling I have for the next fifty years of my life. I have another chapter or two to write first. So what, then? Well, in the past two years there’s been another storyline, too, which I didn’t anticipate. And so as it turns out, over the past year I’ve studied for the GRE math subject test, researched different math PhD programs, opened myself to the possibility of falling in love with this path forward, contacted potential advisors, got support from family and friends and colleagues, put in some applications, got some acceptances (yay! ), made visits, and made a final decision. And I’m really glad to say that I’ll be starting a PhD program in the School of Math at Georgia Tech in the fall. 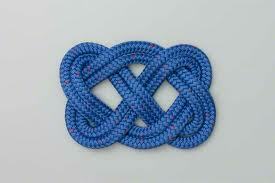 My focus will be in geometry and topology, and particularly in geometric group theory and geometric topology. Both of these fields were—no accident here—shaped by Bill Thurston. There are a lot of reasons I’ve decided to go to grad school. I’ve got some of this typed up, but this is getting long as it is—so stay tuned for part two. Thanks for indulging me this mind dump. These and connected thoughts have been bouncing around in my head for many months now. I’m really glad to be sharing them now! Last Saturday, as NCTM Boston was wrapping up, Tina and I kicked off a round of Explore MTBoS. It’s an introduction to reading blogs and tweeting as professional learning, as well as an exploration of the many resources and projects that the fine folks of the MTBoS have created and shared. Participating in the activities might be a great fit for you. If so, join in! Or maybe you have a colleague who is ready to take their professional development into a ongoing, online space. Please recommend Explore MTBoS to them! Even if you can’t come to those specific chat times, maybe you’ll try and keep an eye on the #MTBoS hashtag this week. Say hello and answer people’s questions! Week 3 of Explore is about Organization—keeping track of everything one runs across online. Do you have a blog post where you discuss how you stay on top of things in a way that works for you? Please let me know about it! Or if you don’t have such a post, take this as encouragement to write one and to let me know. It’d be great to share the fruits of your experience! I don’t know how to reblog from Blogger, so I’ll just point you over to Tina’s post about the #MTBoS Booth manually. If you’re attending the NCTM Annual Meeting & Expo in Boston this week, please stop by Booth 841 to say hi! An even better way to deal with your #BostonJealousyCamp woes? Check out when the next math conference near you will be. See if they have an exhibit hall. Ask if you can get a deal for MTBoS – for NCTM, a booth comes with 6 free registrations, for the price of 6 registrations. So we gathered 6 people, NCTM helped us pool our funding internally and ended up with a booth! Then they helped us out with the carpet and table. Justin and I have done all the work already, and we did it really strategically. We saved our to do lists and descriptions and emails. There’s a google drive folder just waiting for someone to say they want to run a #MTBoS booth at their next conference. We’ll ship you some supplies. The rest you can print from all the stuff we’ve saved in organized folders. You could have your own scavenger hunt! So don’t be sad, get planning. Make this the first of many opportunities for the math teachers of the world to learn there’s an amazing online community just waiting to talk to them about content and pedagogy and more. I hope to see you at a MTBoS booth soon—either during my time in Boston on Saturday, or at the booth you help to coordinate at a future conference! Happy scheming! Sometime soon, you can tweet on the hashtag #WhyMTBoS a reason why the MTBoS is great. If you’re attending NCTM Boston, you can sign up to spend time staffing the booth. If there’s an MTBoS project or endeavor that would be great to highlight at the booth, let us know about it! Let us borrow your internet browsing device for NCTM— iPads would be excellent. And there will be a new Explore MTBoS online excursion after NCTM! Again, for more details, hop on over to the Explore MTBoS site. Yay! A new year of the Mercer County Math Circle will be gearing up soon. I’m also teaching a class once a week this year at PLC called “Math to Love”. It’s meant both for folks who like math and want more, as well as for those who don’t like math and so need something to love all the more. Hopefully I can attract some people to attend. 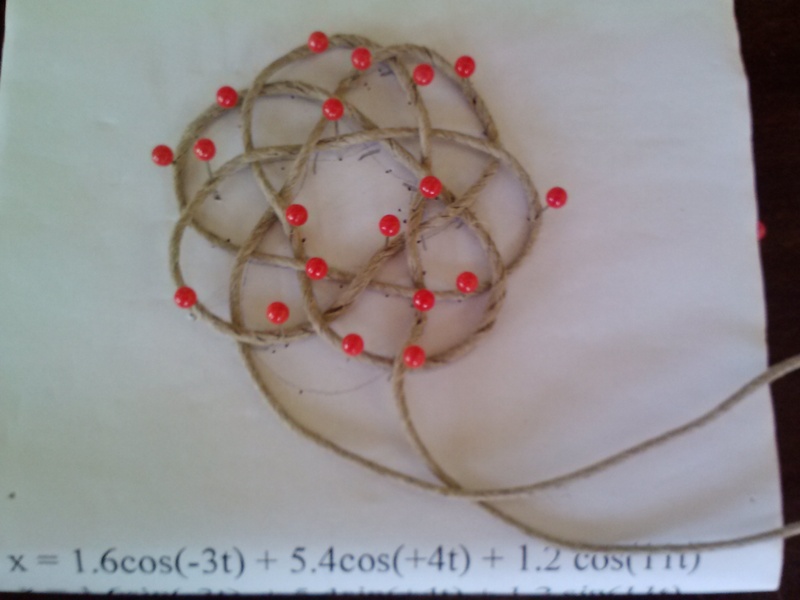 For our first Math to Love class, I made a lesson that I’m also hoping to share at MC^2 soon. It’s about billiards. There is sooooooo much cool math that involves billiards. 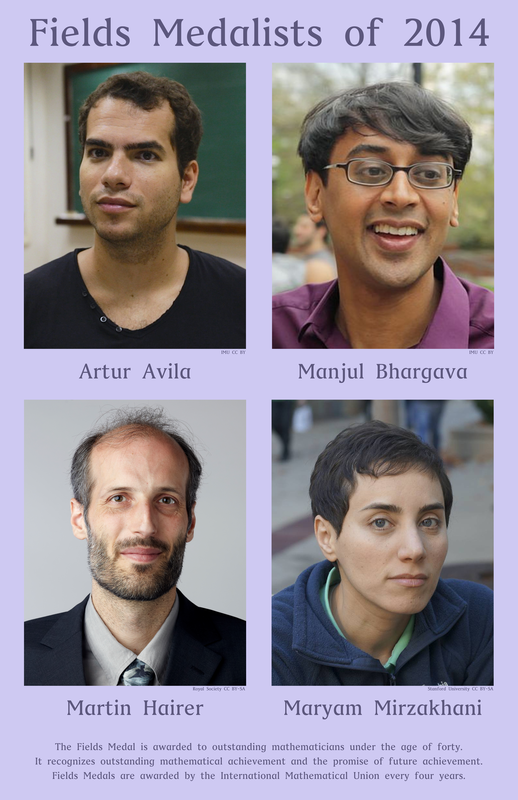 The reason I picked billiards to feature at this particular moment is because two of this year’s Fields Medalists study billiards: Maryam Mirzakhani and Artur Avila. To find out more about these amazing mathematicians, see our recent Math Munch post. Here are some ideas for sharing billiards with kids that I used, or will use, or that someone (you!) could use. the short videos about Maryam and Artur, linked to above. Using Cinderella software, you could share this applet that can show a variety of billiard phenomena. some version of the “bouncing icon” WCYDWT that Dan Meyer shares in these posts. Which corner pocket will the billiards ball land in? One more way to bring this year’s Field Medalists into your classroom? Print out a copy of this poster that I created. I had a lot of fun sharing these billiards ideas with my “Math to Love” class and I’m looking forward to doing it again at the math circle. Hope you found something here to enjoy and to use! Join us as we “halve” some fun while creating some art and solving some puzzles that involve breaking shapes in half. 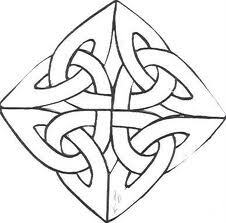 What’s the most beautiful way you could cut a square into two equal pieces? Is it always possible to cut a funky shape in half through a specified point? Whether on grids or with free-form shapes, halving tasks provide many fruitful mathematical opportunities. Come explore and these questions and more! I kicked off the session by showing off some examples of halving art, and giving a little spiel about each. Here’s the slide deck if it’s useful to you. I also shared the Yoshimoto Friends video that Paul and I made. Then I set everyone loose to either make some art or try out some of the problem sheets I’d brought. I also had some physical “halving” puzzles and other models for attendees to play with. It’s Half – I’ve gotten a lot of mileage out of geometric fraction problems like these. On this sheet, you already know that each picture represents a half. The goal is to make clear just why this is the case. Half Frames – These are two problems that anyone can work on, but that have rich connections to algebra and geometry. 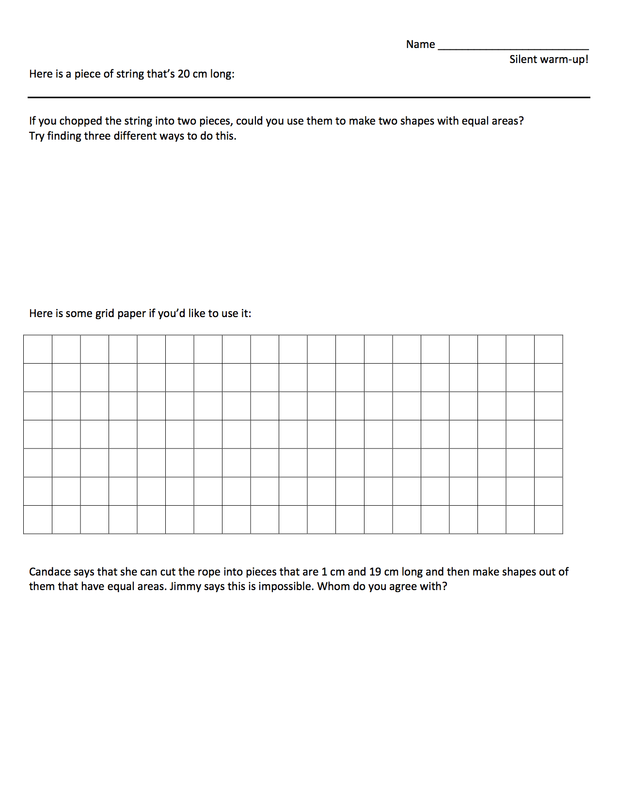 Halving – I always share this sheet with my Geometry classes, ever since I found it in Girls’ Angle Bulletin a number of years ago. It’s also a great jumping-off point for students to make problems of their own! Half Tetra – This is a template for a 3D puzzle to cut out and fold up. Two identical pieces combine to make a regular tetrahedron. Cardstock recommended. Via Futility Closet. 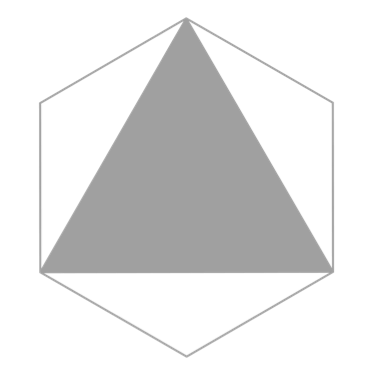 Can you say why the hexagon is half shaded? Attendees made some lovely Truchet-inspired drawings, and one attendee especially dug into the half frames problem—coming up with an interesting conjecture in the process. :) A middle school math teacher who attended even planned to share some of the problems with her students. Maybe you’ll find fit to do so, too. Let me know if you do! Here are the thoughts I had (comment-turned-post) and an attempt at reworking the task. Experiences with problems often become more powerful when they’re not just one-offs—when they’re surrounded by some kind of context. One kind of context that I find fruitful is the notion of a problem space. Most of the interesting aspects of the circle-square problem that Dan highlighted—like “assigning a variable” and “constructing a model” and “using operations on it”—aren’t specific to the geometric figures of circle and square. They equally well apply to similar questions (some easier and some harder) involving many different kinds of shapes. The circle-square combo does have a nice “classic” feel to it, but if we care most about the mathematical practices and methods involved in solving it, then we might do well to also explore variations on it. In addition, the circle-square task as it stands puts the bar at one specific level of difficulty and requires certain algebraic and geometric skills to be firmly in place for a successful solution—and really even to make any significant headway. Whenever possibly I prefer to lower the threshold for success in a task while also raising the ceiling—an easy way to let students self-differentiate a task. I might have string and scissors on hand for students who were interested in using them, but my sense is that the problems as I’ve stated it—and the solution methods students are likely to take—is sufficiently concrete to make manipulatives perhaps useful and fun, but not necessary. 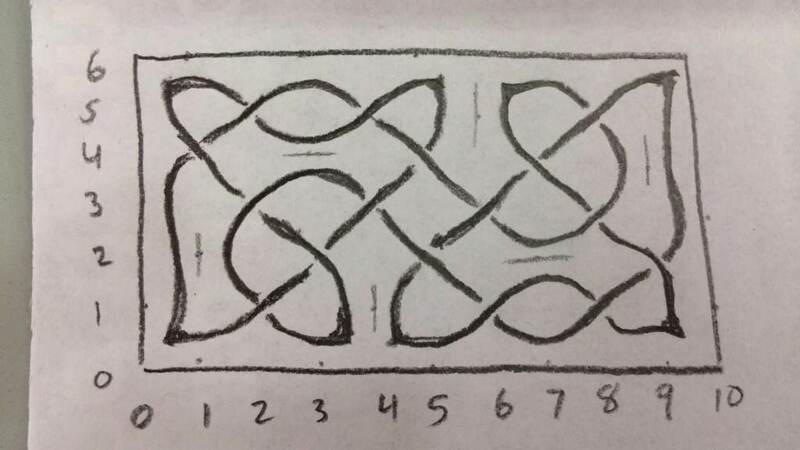 What would happen after student had a chance to work on this sheet on their own for a bit? Well, they’d have time to share what they came up with in pairs or small groups. Then we’d do some sharing as a whole class and discuss solutions and conjectures. 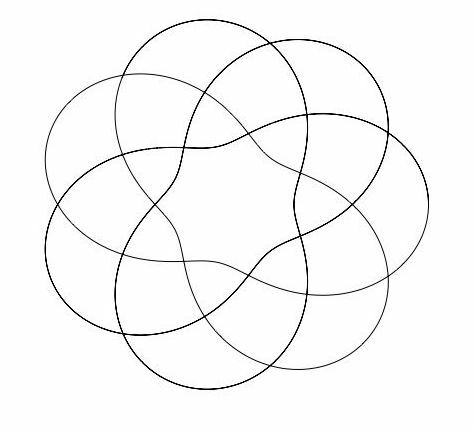 That’s another thing—there are so many equally and perhaps even more interesting mathematical questions that can arise in this particular problem-space than the circle-square one that we’re (likely) headed to and that prompted this whole adventure. I’m sure the directions that students would take this in and the questions and problems they would pose would be fascinating and worth pursuing. They’d also likely provide richer and more powerful mathematical experiences than the circle-square problem on its own would, and solving this problem would carry a new significance in light of the other problems that had been posed and solved prior to it. I can imagine using this warm-up worksheet with middle schoolers, but I also think it would be an appropriate onramp to the circle-square problem for sophisticated high school students. For both audiences it will clarify the circle-square problem and build context and experience for the students. If the circle-square problem is the main course, it deserves both to have appetizers to whet everyone’s appetites and to make sure everyone has a seat at the table before the meal is over. Because let’s face it: mathematical meals in school are all too often hurried affairs. Those are my thoughts so far. What do you make of them? On Monday I was walking with one my colleagues (Paul Scutt) as we tromped around Cranbury, NJ, on an excursion to the local historical museum and the store fronts of the town’s main street. 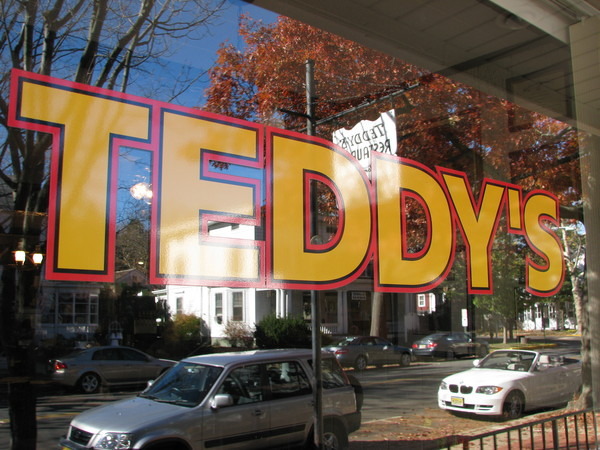 We’d just had a bit to eat at Teddy’s, a local diner. Paul was wondering about a possible discrepancy in the bill and was calculating what the price of one drink must be if the total we’d been charged for three drinks was $5.25. Paul was working out the quotient aloud in the style of long division. “3 into 5 is one with 2 left over…” Going through the steps was tricky—there was some retracing steps and checking involved—but things carried through and the answer came out as $1.75. This squared with the prices on the menu. All was well. It was an occasion to recall that over the course of my years of teaching math—and middle school math, in particular—I’ve developed a preference for fractions over decimals. Decimals, I’ve been inclined to argue, are just a special case of fractions—fractions with powers of ten in the denominator that we can suppress with a bit of ingenious and pragmatic notation. And decimals are a very slick trick—calculating with them is practically verbatim from whole-number arithmetic. The ability to think flexibly about both decimals and fractions and to move between them comfortably is certainly the ideal. But how do we help students get there? What are the paths that we carve? What thoughts do you have to add? How do you think about the relationship between fractions and decimals? How do you talk about this with your students, or how might it affect your classroom silently? What is your own relationship with computations involving fractions and decimals—any preferences, for any reason? And what are good examples of their relative strengths and weaknesses? What lines do you draw?